REPOSITIONING - We guided the creative transition of a 75-year-old restaurant food service line into the retail market. To increase brand recognition and shopability bold graphics and warm photography were arranged on the can designed for retail to add to consumer appeal. Message changes included primary colored banners indicating flavors, multi-lingual usage directions, expanded nutritional information, and product fact panels were applied to global packaging for respective markets. EXTENSION - The brand repositioning started with two SKUs and increased to several flavor varieties. Color-coded lids and label banners differentiate flavors including a specialized version for the “All Natural” variety. This new design scheme was adapted to marketing communications including sales, commercial print, and web. SALES - To increase sales and introduce new flavors at a low cost we designed commercial sample kits for Golden Malted Waffle mix. This project included designs for sample flavor packets, mail ready promotional box, collateral containing directions for use, and messaging that added brand value and helped sell the product to prospective distributors. MARKETING - Created a distributor incentive program to stimulate sales within smaller restaurants. Designed and executed a rewards program for distributors and wait staff to earn cash and prizes for promoting the product and building the customer database. 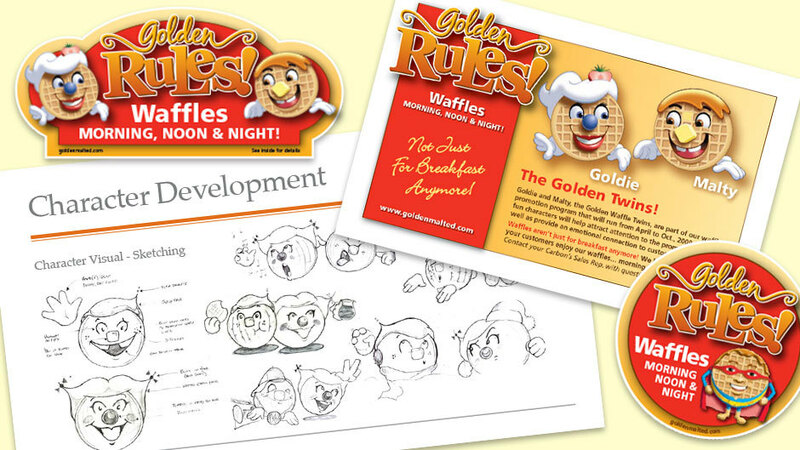 This awareness program illustrated to restaurant owners that waffles are a high margin menu item and created a direct marketing channel to consumers.